Rep. Steve King released a letter Tuesday signed by dozens of religious and conservative leaders calling for House Minority Leader Kevin McCarthy to reinstate him to his committee assignments and apologize. "200 pro-family leaders wrote @GOPLeader McCarthy asking him 'to do the right thing' & reinstate my committees," the Iowa Republican tweeted, along with a link to the letter. "They know when the 'outrageous misquote' of a biased & liberal NYTimes takes free rein to 'falsely brand' Republicans, no conservative is safe." 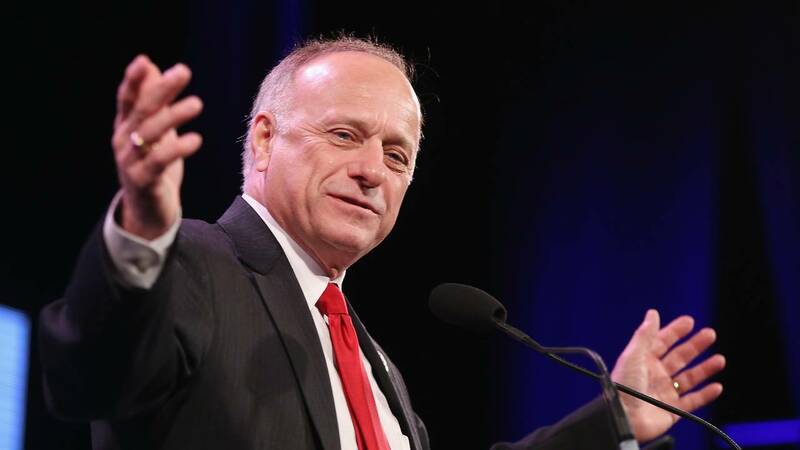 King was removed from his committee assignments in the new Congress last month after he appeared to defend the term "white supremacist" during a New York Times interview, the latest among numerous public statements widely seen as racist or insensitive. King has since said at a town hall that he isn't racist. In Tuesday's letter, the leaders -- mostly representing faith-based advocacy and conservative media groups -- said they were "appalled that Republican leadership would choose to believe a liberal news organization famous for their bias" over King. The leaders -- who include William Owens, the president of the Coalition of African-American Pastors; former House Majority Leader Tom DeLay, R-Texas; and Janice Daniels, former mayor of Troy, Michigan -- argued that removing King from his committees would have been justified only if he had doubled down on "the outrageous misquote of the New York Times," but that "the opposite is true." "Unlike North Korea, we in the United States are 'innocent until proven guilty' and hold to the principles of Western Civilization, as Rep. King so admirably does," the group wrote, citing the tenets that all men are created equal with rights to life, liberty and the pursuit of happiness. "These are the principles to which Rep. King was referring and which he has championed for more than two decades of public service," the leaders wrote. "Don't make the fatal mistake of turning the reins of the U.S. Congress over to the liberal media, allowing them to target, misquote, and falsely brand any member of Congress they wish to remove." In a New York Times interview published in January, King, as part of a defense of what he said was the "culture of America," asked how certain terms had become controversial in modern discourse. "White nationalist, white supremacist, Western civilization — how did that language become offensive?" he told the Times. "Why did I sit in classes teaching me about the merits of our history and our civilization?" Responding initially last month, McCarthy called King's comments "reckless" and "wrong." "Everything about white supremacy and white nationalism goes against who we are as a nation. Steve's language is reckless, wrong, and has no place in our society," the California Republican said in a statement. In a statement Tuesday, McCarthy's office indicated the letter would not change his mind. "Leader McCarthy does not plan to change his mind regarding Rep. King not receiving committee assignments," the statement read. King said at his January town hall appearance that his quote was only referencing Western civilization, which he promised to defend from alleged affronts from the left. "What I was addressing was not those terms of white supremacy or white nationalism," King said. "Yes, (the Times reporter) said those terms to me, and yes, I responded to his question about them. But when I said 'why did that language become offensive,' I was speaking exclusively and directly about Western civilization." The controversy surrounding King's views on race, however, extends well beyond the comments published in the Times. He has previously retweeted a Nazi sympathizer and has sponsored a white nationalist fringe candidate for Toronto mayor.